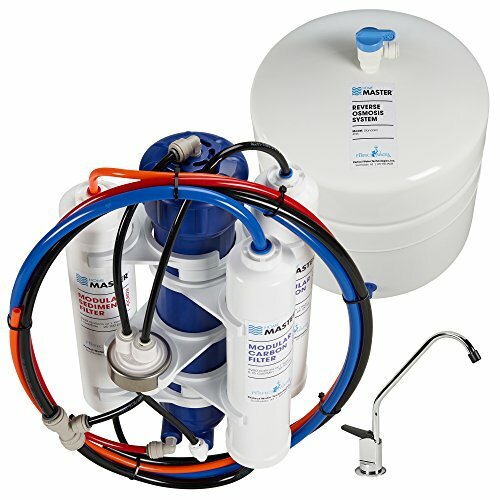 The Home Master Standard is a reverse osmosis water filtering system specially designed to fit under a kitchen countertop, in a normal sized cabinet. In the following article, we examine the best and worst features of this model, and we establish the pros and cons of using it to produce pure water. One of the advantages of using this water filtering system is its longevity. Home Master developed an innovative design that solves most of the problems you’ll encounter in other reverse osmosis filters. The design will allow you to use the filter for a longer time, increasing your investment’s value. Another advantage is the built-in filters. Unlike the filters other models use that have to be twisted or slid into an existing casing, this unit’s filters have their own housing which is changed at the same time with the filter. This increases the filter’s longevity and performance. This filtering system is easy to install. The installation kit contains everything you need for the installation process, and the installation instructions are also very easy to understand and follow. This unit comes with a 5-year limited warranty. The long warranty period is an evidence of the confidence the manufacturer has in this product. Reverse osmosis systems usually produce a lot of wastewater for every gallon of filtered water they produce. Some systems can produce as much as 24 gallons of wastewater for every gallon of pure water. It’s generally considered that systems that have a wastewater production of up to 4 gallons per pure gallon are efficient. This model has a wastewater pure water ratio of 4:1, which makes it fit right into the efficient systems category. However, this model is not very efficient. Some models can have an efficiency of 1:1 or 2:1, so this model is at the edge of this category. The Home Master Standard uses high-quality filters. These filters are capable of removing up to 99% of the contaminants from your water source. Changing the filters is a very simple operation. You just have to take them out and slid a new one in. This reverse osmosis system uses a modular filter design. This design is better than the classical canister design because it increases the filter’s longevity. In a canister design, the casing remains the same and you only change the filter cartridge. This can lead to an accumulation of contaminants in the canister, which can over time make them weaker. This can further lead to leaks, and ultimately, the whole filtering system can fail. The advantage of a modular filter design is that not only the filter is disposable, but the filter housing as well. This means that at every time you change the filters, you also change the housing. This makes the annual changes simple and efficient, and it also lowers the chances of a bacteria buildup. The modular filter design also makes the filters more efficient. The filters can be changed once a year or when they filter 3,900 gallons of water. The Home Master Standard is very easy to install. Most people will be able to install it themselves in under two hours. You don’t need to have any previous plumbing or RO systems installation experience to set up this unit. The filtering system comes with a good instructions manual you can follow for a step-by-step installation guide, but you can also watch the instructional video tutorials if you find it easier. The tutorials are very thorough and you will be able to complete the installation if you follow them closely. The purification unit is fully assembled, so it will be easier to install this unit than other models. All the filters are already in place, so all you need to do is to make the proper connection. The cables are color coded, so this task won’t be too difficult. Modular Filter Design – The Home Master Standard uses a modular filter design. This design makes it easier to change the filters, and it also makes the filters more efficient and durable. 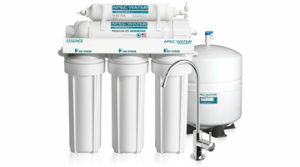 Long Lasting Filters – The filters used by this RO system have to be changed only once per year. However, if you filter a lot of water daily, you should change the filters when you approximate they filtered 3,900 gallons of water. Efficient Filters – Not only are the filters capable of blocking up to 99% of the contaminants in your water, but they also give a great taste to the water. Good Water Production – This system can produce up to 50 gallons of pure water every day. This is a good water production rate, and it should cover all your needs. Faucet Looks Cheap – This unit comes with a small faucet. The chromed faucet doesn’t look too bad, but the plastic adapter ruins its overall design.